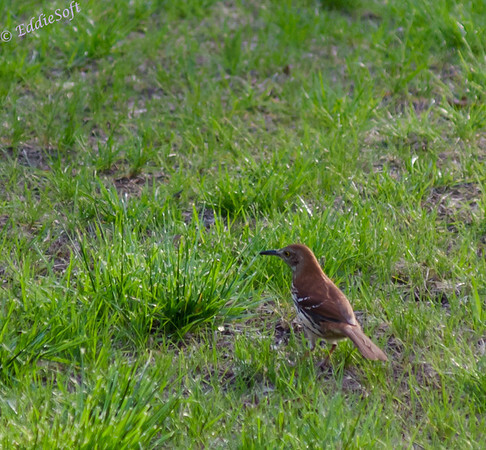 Since the moment we started building our house in the woods, I’ve been busy taking photos of all the birds that drop by from time to time. 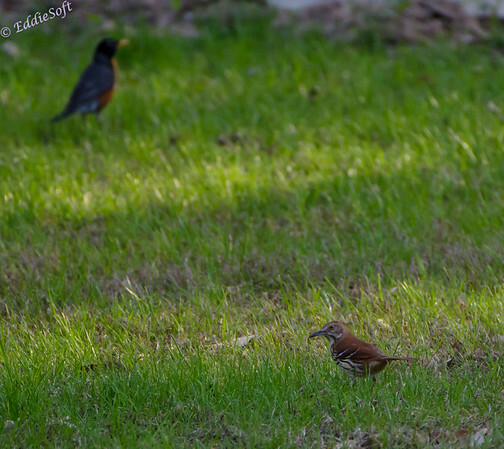 After awhile the diversity of species begins to fade as the same bird types tend to inhabit the same area year after year. Some become so familiar that their tiny imperfections allow you to actually give them names. Don’t get me wrong, I still enjoy taking their pictures – if nothing else, the light settings and perch choices are always unique so there is always a challenge. The main point of mentioning this is it makes new arrivals a big deal around here. As soon as I spot a new bird type, I scramble for the camera in the hopes of getting a least some sort of picture to capture the moment (and to have proof for adding another check to my watch list). 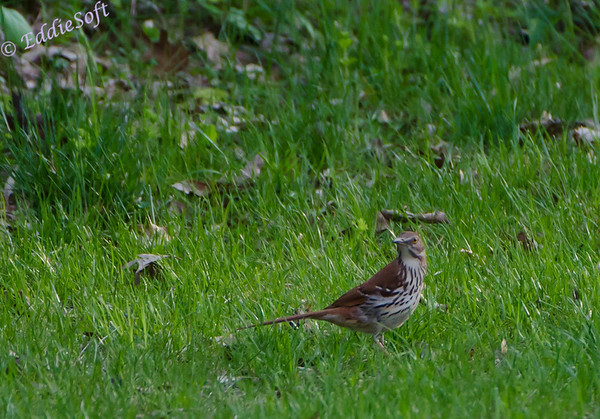 As you can probably guess, I spotted a new bird to the homestead a few days ago. Luckily, I was able to get a few shots. As with all my pictures, the full versions can be seen on our Photography site at eddiesoft.smugmug.com. If you go there, you can view them at any size you want up to the original size (note, I always use medium for images in this blog). So, after dinner I looked out and noticed a strange bird a ways out from the house. Immediately thinking this might be a new find, I grabbed the closest camera (D7000) and headed out to the porch in hopes of snapping a few shots. Our Beast was not currently on this particular camera having stored it away after our last photo shoot. Luckily, the 80-200 glass was attached giving me some reach into the yard. I was fighting the light going down as well trying to steady myself while hand holding the camera – must have been all the excitement of the chance to capture a new bird. On full manual, I had to bump the ISO up to 800 for most of the shots in order to get the shutter speed I needed to help compensate for my shaky hands. The shot above is a full shot giving you some perspective of the distance I was dealing with (this was at full 200mm I believe). 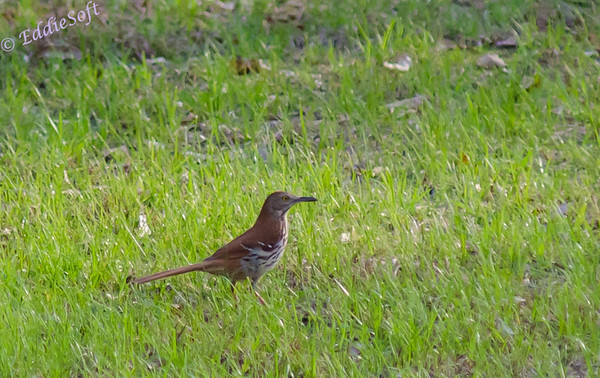 As you learn pretty quick taking bird pictures, any distance at all causes that bird to appear pretty small. However, with the power of crop, we can take you a little closer in. Hit the jump to see a lot more (and better) pictures of my feathered friend. 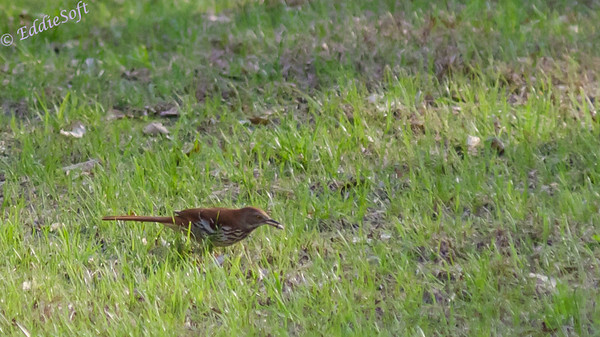 A quick validation on the camera LCD confirmed that this was indeed, a new bird for my collection. At the time of shooting I had absolutely no idea what it was beyond the cool feature of having bright yellow eyes. 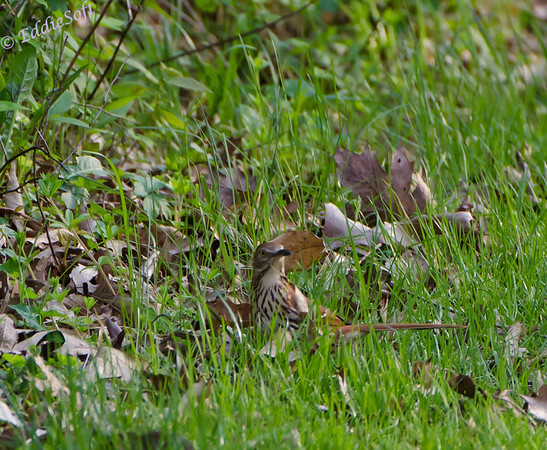 For the next 10 minutes I proceeded to track this bird as it hunted around the backyard pecking at the ground and picking through the leaves. He also kept crossing in and out of some sun rays making their way through the woods which caused some extra work to keep the exposure right. There is definite room for improvement, but I am still getting my hands around full manual mode. At the same time I was trying to find something to brace the camera with, hesitant to leave the scene to fetch the tripod. After taking the following shot, I was a little frustrated since I wasn’t able to keep the camera as still as I wanted (note, this glass does not have VR). As a result, the cool shot of eating a grub is not tack sharp. Okay, it was time to break down and go get The Beast. This was a commitment of time since the glass needed to be removed from its suitcase and the lenses swapped off the camera. Once done I strolled back out on the porch expecting the subject to have flown off for more private dining. To my surprise, it was still there although it had move further out from the house and decided to check out the food options under the dead leaves. 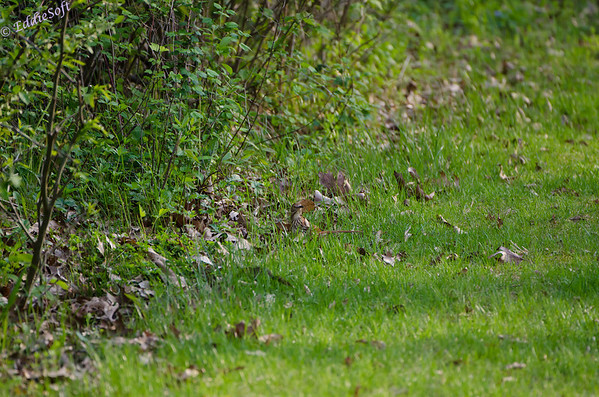 The following full shot is with the 200-400mm at full 400mm. As you can tell from comparison with the first shot, this has definite reach. Do you see the bird? It is easier to see in the larger images on the photo site, but as with the shots above I can bring it in via crop. There it is! I think it is on to me now, it just may be the bazooka I have aimed at it. The first thing to notice is the colors with the beast lens seem a lot more vivid and the VR definitely compensates some for the camera movement – trust me, at 400mm any tiny movement at all causes significant motion in the frame and keeping a 7lbs glass steady is some definite work. The following is a similar shot that I actually like better, but I didn’t want to try to pull one over on you and swap out the crop for a different image. After awhile he gave up interest in me and went about the business of dinner. Murphy’s Law applies, of course, since now that I had the big glass on he didn’t find any grubs to choke down. Rizzi decided to try and intimidate the bird with one of his patented loud barks. 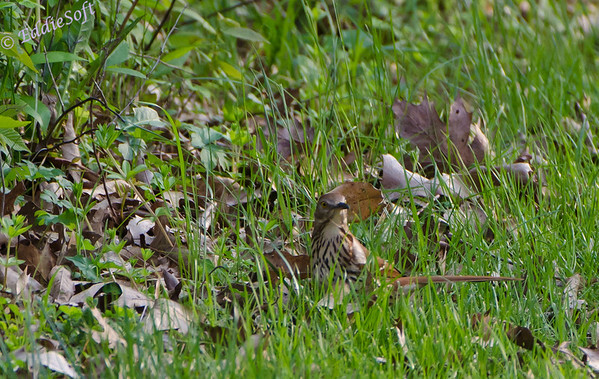 This startled the bird at first and ended up looking back for the source. Probably noticing it was just a prissy toy poodle it turned its attention back to the task at hand. This is probably my favorite picture of the bunch. The pose showed all the features of the bird and the yellow coloring in the eye stands out pretty good in the shadow line. At this point I am a big fan of the VR especially when compensating for the hand hold. 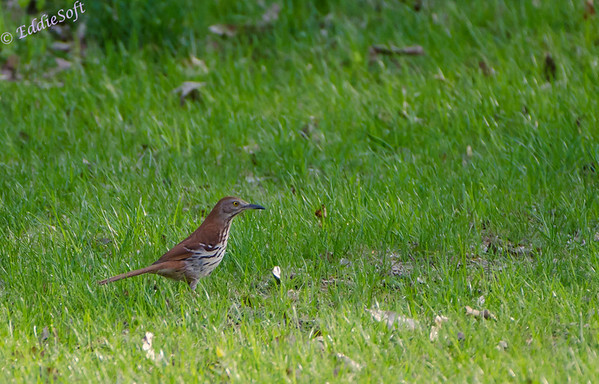 I included the following picture because every bird book I looked at compared the size of this bird to a Robin. 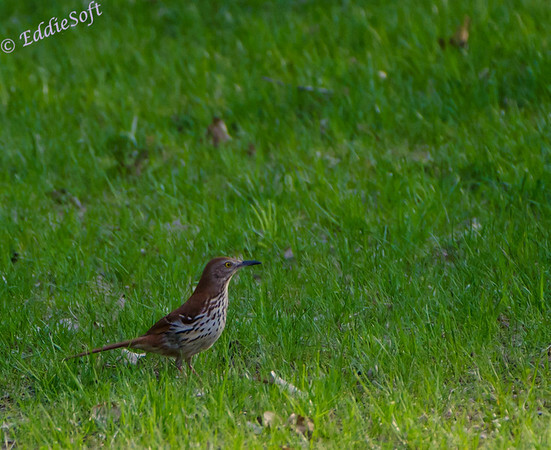 Sure enough, I was able to capture the two together giving a first hand comparison. 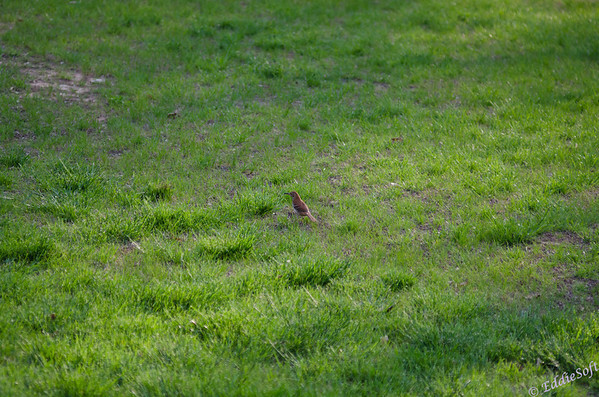 Yes, the Robin came out a little blurred, but that was due to the aperture being set for faster shutter speeds. Well, hope you enjoyed pictures of my new visitor. Don’t panic, I know I’ve withheld a key piece of information. I was trying to give you time to figure out what it was on your own. 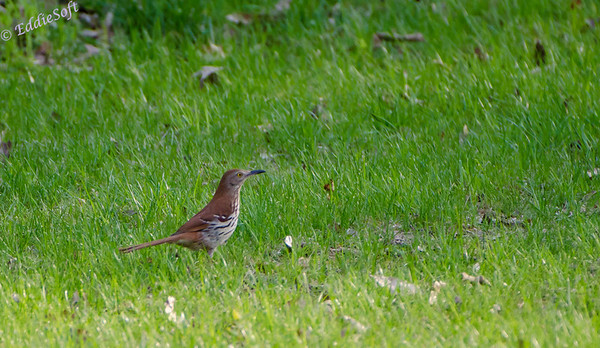 If you guessed a Brown Thrasher, then you win the prize. I hope to do a more formal post on the comparison between the 80-200mm and the new 200-400mm zoom in the future, but this gives a little teaser.